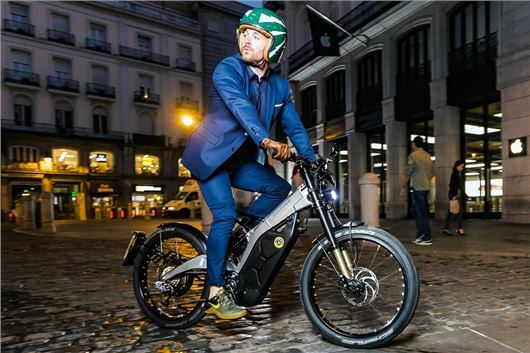 Bultaco (which is a motorcycle and bicycle manufacturer and not a Mexican takeaway dish) has unveiled the Albero - a sort of hybrid between a modern electric motorbike and a city bicycle. Like a motorcycle it has a twist throttle on the right grip, delivering a maximum of 60Nm of torque – but it also has pedals and a lightweight design, so you can park or ride it pretty much anywhere, including down cycle lanes if you go for the 2.5 version. This can be ridden by those over the age of 14 and has a limited top speed of 15.5mph, but that’s plenty if you feel like commuting without effort. If you have a driving licence you can pick the 4.5, which requires a category AM entitlement like a scooter, and has a higher top speed of almost 30mph. Either way, charging takes three hours and provides a range of up to 60 miles, depending on the drive mode. Leave it in the sportiest setting and range is still respectable at roughly 30 miles – plenty for city riding. Want one? Of course you do. Prices aren’t confirmed, though - and we don’t anticipate them being cheap. The Brinco, on which he Albero is based, costs almost £4000. We anticipate the new bike will be a little cheaper, but it’s still going to cost a lot.